Excellent condition. Was my lease car for 2 years, loved it so much I then bought it. Just had service & MOT (expires 28/02/2020). 56k with full VW main dealer history. Usual (standard) spec including adaptive cruise control, DAB, Bluetooth etc. no options. All invoices, manuals, spare key (unused) present. Was ceramic coated when new to protect the paintwork and keep it looking like new (which it does as you can see in the pictures). Very well cared for, only ever cleaned by myself using the correct equipment/methods to keep it looking great. Only one minor mark to note is on the back bumper (see picture) but this can rectified easily. The car is also booked in with a local specialist for a DSG pump rebuild so the car will be all ready for the next owner to enjoy. Please let me know if you have any questions. Lol, talk about off-topic! Thanks to those who advised about their replacement screen! Thanks for the replies everyone. Probably safe to go with insurance Autoglass then as long as it's stamped with a recognised brand. Have an almightly crack due to stone impact this morning. After searching & reading some historic posts, there's mixed messages regarding OEM/non-OEM replacement glass. In my opinion, the VW glass seems to chip easily, but equally don't want to end up with something of poorer quality if I go with non-OEM. Can anyone give me any feedback on their replacement screen, i.e. was it OEM / was it decent quality / better or worse than the original fitment? Thanks in advance. Â£189 through Aviva.....same price as my 20 yr old Audi. Defo something odd with the tracker. My car went to "build in progress" three weeks ago (also got the text). Has now gone back to "build week confirmed". Mine has also just jumped from stage 2 to stage 4. Ordered early October. Original estimate was 50, then 51. I think we are now in 47? Still aiming for 1st March collection. Cheers all. Will be looking to this place to make the wait a little easier! Just joined having done some research on here & placing a PCH order with Peter Cooper VW in the south coast. Previously had an R32 DSG, Audi S6, so I like fast VAGs!! With the great PCH deals around, I was ready to place an order without a test drive or visiting a dealer. My head for the better of me and I paid a visit to Peter Cooper in Chichester to meet the sales guy and to have a decent test drive. Completely blown away (as I knew I would be), plus glad I've met them in person. Also have a T3 multivan, previously a few air cooled toys too. Currently driving an Audi 80, so the wait until March is going to be hard!! Got your PM but unable to reply - could be my post count. First post here! I've just placed my order with Peter Cooper VW (PCH with VWFS). Been dealing with Ben & Andy in the Fleet Sales dept - great service so far. 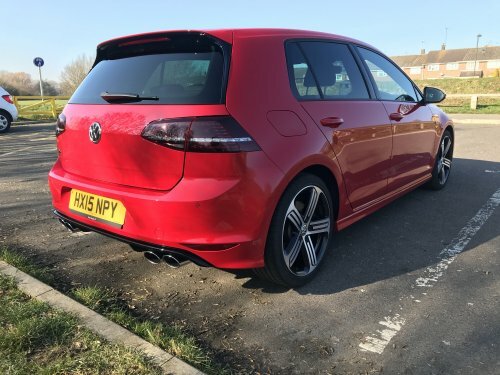 More competitive than any broker, plus easier to pay a visit to 5dr DSG, no options, tornado red, Â£284 pm on a 3+23 with no fees.